The year is 2005. My band just broke up, and I’m devastated. At least I can keep making music on my own. In the midst of that, my cousin Mitch takes his life. Ouch. I grasp at words. “Shipwrecked” – that one seemed to stick. I wrote a handful of songs that were meant for my first EP, but with my producer’s encouragement, I proceeded to write and record two more songs to make it a full album. The songs speak of challenges in relationships, the inability to live up to impossible ideals, the struggle for identity and independence, the human condition, and parting words for friends and fond memories. 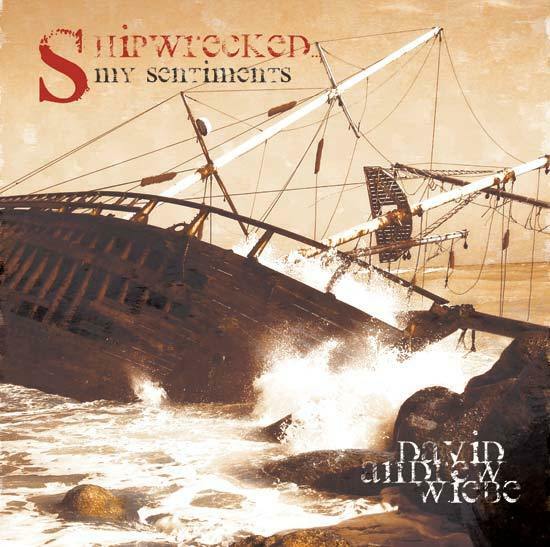 Principal recording for Shipwrecked… began on September 5, 2005 and was completed on April 11, 2006. By June of 2006, the CD was packaged and ready to be sold. The release, however, was pushed back until later that fall. The release party was held at Karouzo’s Pizza Steak House & Lounge on September 8, 2006 in Calgary, AB. An experimental approach to conventional rock. With great song-writing skills, great vocal tonality, and a tight sound on acoustic, electric, and bass guitar, David Andrew Wiebe delivers a killer sound. His guitar solos cut through tracks with an axe matched to the late and great Hendrix. The music stands alone with great production, effective group chemistry, and a really rocking sound. With sounds similar to Pearl Jam, Green Day, Incubus, and the Sea and Cake meets Eric Clapton with Elvis Costello tinged vocals, this album encompasses the struggles of modern man and the desire to break free from conventional boundaries. Tr. 1 – “Six Sides” – This opening track kicks listeners into gear with fantastic momentum, a great violin melody, and killer guitar. Wiebe takes lead and sends to listeners the mystery of chance in life. Tr. 6 – “Human” – A very moving track that gets you up and on your feet. With seamless transitions into a great chorus filled with great hooks, this song is bound for popularity. Tr. 9 “Between the Lines” – A track full of witty perception that puts into perspective the inner contradictions that lay within the nature of man. Great musicianship and a social message delivered to boot. Eric Clapton’s bluesy guitar style had a significant impact on the direction of this song. I wanted to put my own spin on a typical E5-G5-A5 type chord progression, so I turned the chords into dominant 7ths. Technical jargon aside, this makes up for the jazzy/bluesy sound you hear on the song. The Mourning Widows had a lot to do with how the chorus took shape, and Further Seems Forever inspired the backing vocals for the chorus. Some of the jazzier parts of the song were likely (but unknowingly) inspired by the likes of Remy Shand, Ivana Santilli, Eric Johnson, and Wes Montgomery. This song came about when I slapped a capo on the 3rd fret of my guitar, and started playing around with some chords. It was one of those rare moments of inspiration that turned into a full-fledged song. To some extent, worship music inspired the direction of this song. One of my favorite bands, Extreme, helped inspire the funk-rock groove on this song. It wasn’t originally arranged the way you hear it on the album, but it’s one of those songs that keeps changing and evolving, even now. The Mourning Widows inspired the backing vocals. Remy Shand and Further Seems Forever provided some lyrical inspiration for this song. It’s the darkest song on the album, addressing some of the tougher issues I was dealing with. Extreme had a big influence on this song. I think The Police may have also had a part in this, but inspiration is a funny thing because it isn’t always taken deliberately. It’s a happy accident, because The Police is a wonderful band and I love their music. In retrospect, I think Collective Soul had a lot to do with the direction of this song. It was also one of the first songs written for the album along with Six Sides. To some extent, worship music may have influenced this song as well. Extreme was a big influence on this song (particularly their III Sides to Every Story record). I felt that the chorus made an important personal statement. Extreme, Van Halen and Harem Scarem had a lot to do with the musical direction of this song. I think it’s about the only song on the list that was suited for the end of the album. Why do I keep on falling? Do you see me as your clay to mold? Why did I care about your vanity game? This is all I ever wanted, why did I even try?